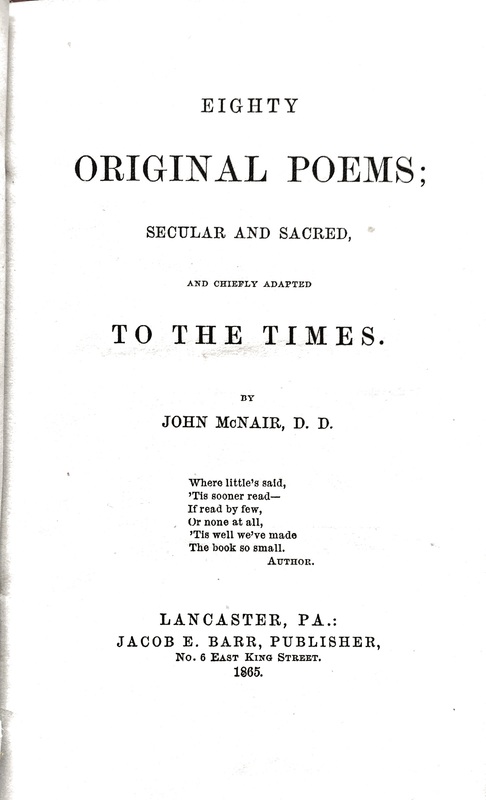 Besides being a minister, an evangelist, a Chaplain in the Army and public speaker, John McNair was a poet. He published his book of poetry Eighty Original Poems Secular and Sacred Chiefly Adapted to the Times in 1865, after the Civil War ended and just a little over a year before he died at the age of 60. The book of poems was what originally guided me to Rev. McNair. My grandmother gave me the book of poetry when I was in my 20’s and when I was looking for a project for genealogy class at the University of Washington, Rev. McNair became a logical choice. Who knew I would still be going back to this small book of 80 poems to try to understand John in a deeper way and fill in the gaps when records can’t tell the story. I am not sure if John was a great poet, in fact, I suspect he wouldn’t have been classified as particularly remarkable by literary critics. However, he wrote about a variety of topics from Washington, Garibaldi, the death of Lincoln, succession, drunkenness, self-conceit, his mother, home, women, the flag, Sabbath breakers, death, being a minister and my favorite “The Man of Honor” which I believe was his own personal code and the ideal of who he wanted to be. I have used his poetry throughout the book of his life to illustrate his feelings on specific subjects. How cool is it that I have his own words, even if they are in rhyme! How did the book get so far afield? How many copies of the book were printed? Isn’t it fascinating that these libraries actually wanted it??? The next thing I did was to see if there were copies I could buy somewhere. And yes, there were two copies available on Amazon through their 2nd hand booksellers. One was $65 and the other $74. Amazing! Just how many copies did Rev. McNair get printed? Did he sell them or give them away? His book of his poetry just keeps me returning for new insights. Finally – I am at the end of writing about Rev. John McNair’s life for the 2nd time. It still needs a few small holes filled in that require research trips to Pennsylvania and New Jersey, so I am struggling whether to do a small print of the book to give to my family for Christmas even though it really isn’t done. I just don’t want to send it libraries like the Princeton Theological Seminary where he went to college if it’s not complete. But, when is genealogy research ever done? Will I ever be happy with having done enough? I don’t know. What do you think I should do? This entry was posted in McNair Family, Writing Family History and tagged Eighty Original Poems Secular and Sacred Chiefly Adapted to the Times, Rev. John McNair. Bookmark the permalink. This is so cool. In all the times I’ve heard about John McNair, I don’t remember hearing about the book of poetry that started it all! Without reading your book (which I would LOVE to do), I’m guessing that you’ll be a lot happier in the end, if you do one more round, and fill in the last holes, before you even do a small printing. And I hope when you say “my family for Christmas” you will include your oldest friends in the world, even if that is Christmas 2017! Of course I will give you a copy of the book if you want one! Oh my, you really must love me if you want a copy of a book about an ancestor that isn’t even yours!